I'm here to teach you how to effectively get drunk outdoors and in front of people without anyone being the wiser. Now you might be saying to yourself, “But MJ, I know how to drink alcohol in public, I do it all the time.” Well let me stop you right there. Anybody can throw vodka and Capri Sun into a water bottle and walk outside but you're not fooling anybody when you wince after every sip and your “Crystal Light” smells like liquor. And let's be honest, you wouldn't drink like that in the comfort of your own home so why should you have to subject yourself to that kind of desperate behavior as you enjoy a midday stroll through your local park or college campus? By utilizing the following key stealth drinking tips, you won't have to. Weapon of Choice - Now the point of this workshop isn't to simply get you outdoors and into crowds with a brown paper bag over your bottle of Jack. Millions of people do that everyday. The goal is to to have a good amount of alcohol without anyone around you realizing or questioning your behavior. The first step is choosing what you will drink out of. 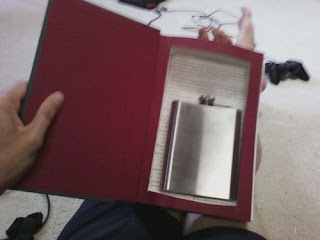 Your “booze-vessel”, as it were, is they key to your successful public intoxication. 1) Classic Water Bottle - Classic water bottle is classic, but that is exactly why it shouldn't be your first choice. Everybody knows that people fill water bottles up with mixed drinks or straight up liquor. Using one of these could be troublesome and may raise suspicions. 2) Flask - Now while I will admit the professional drinker is never without his flask, this will not serve well for our purposes. The flask is a less than inconspicuous tool for public drinking. As you cover your face with your jacket pocket to take a shot, people may mistake you for their dirt bag, alcoholic uncle or someone that owes them money. People WILL know that you are drinking unless you duck into alleyways or public restrooms to drink. Movie theaters, however, are made for flask users. 3) Soda can - Thats right, the common soda can (sodacannus pepsicola). This ounce of aluminum is your greatest tool in defeating public soberness. The can acts as an effective drinking cup and serves well incognito with its natural urban camouflage. Useful in almost any circumstance, people wont think twice as you casually sip from your can of “soda.” Also carry an extra can of soda in case you actually want some. Think ahead. The Juice is Loose- Now that you know what you're drinking from it time to fill it up. That's right, the next key decision a you prepare for greatness is what you will drink. 1) Beer - Now unless you're going out by yourself for a quick, after work pickmeup, beer wont be a good choice. People will start to ask questions as you're toting around an already opened 6-pack of "Slice." 2) Liquor - If you prefer a mixed drink, as many of us do, be my guest. However, be aware that the smell of alcohol may give you away. More importantly, try to avoid filling your can up with straight liquor. While this will get the job done in a timely fashion, carrying around a soda can full of tequila may get you noticed fast if you are not careful. Not to mention your friends might set up an uncomfortable intervention upon finding you out. Plus, why would chose tequila? There are better alternatives. 3) Wine - Yes, wine. The best of both worlds. A twelve ounce can will hold three glasses of wine so two of these babies will get you where you need to be, if not very close. Ever wanted to enjoy that 200 year old bottle of French chardonnay but you never found your apartment to be quite the right environment? Well here's your chance! Protip- don't use red wine. Stained teeth are a dead giveaway and have been the downfall of many amateur wine ninjas. Now you know all you need to to become a master stealth drinker. Use this knowledge for good only. If you use your new found abilities for evil you may soon find yourself passed out alone in a gutter wondering where your life went. So be smooth, be smart, and good hunting. This entry was posted on October 4, 2009 at 12:14 pm, and is filed under alcohol, stealth . Follow any responses to this post through RSS. You can leave a response, or trackback from your own site. ^Ha, I've actually never thought of it using one before. I wear a leather jacket often, easy to hide flask, but Markymark doesn't. .... This has inspired me to writing an article on how to Smoke weed and not get Caught. Nice article. Do you happen to know of any white wines that are drinkable and are suitable for a university student's wallet size? Yeah, franzia is of course always viable. I prefer any cheap reisling or, when feeling awesome, cheap champagne. Dearest Mark and Steve, specifically Steve. Why would you allow Mark to be the authority on this? He's basically the least stealthy drinker on the planet.